Sometimes working in marketing can feel like standing in the eye of a tornado. It is easy to find yourself at a standstill as trends, tools, techniques, apps and algorithms whirl by at a dizzying rate. You may have heard talk lately about the conversion to Vertical Video. Remember that video a few years ago that told us all to “Say No to Vertical Video”? Someone needs to take that video off the internet. The ubiquity of smartphones in our pockets has led to an increased appetite for smartphone optimized content. 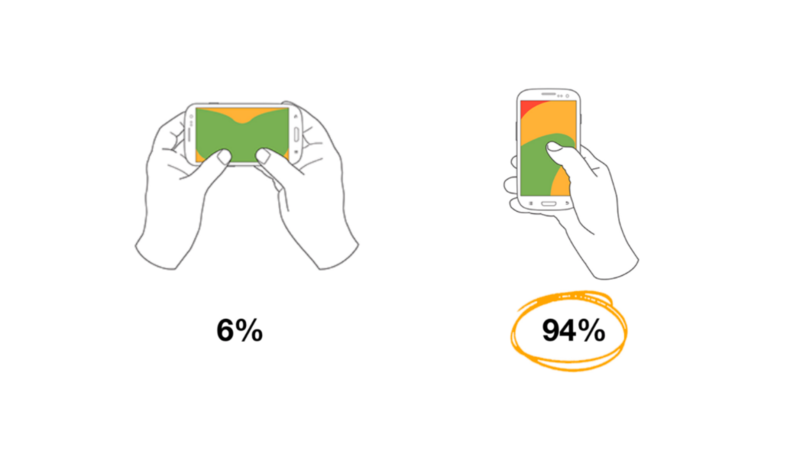 Since 94% of us hold our phones vertically, it makes sense that digital advertisers are creating content that is meant to be viewed in that orientation. SnapChat started the trend towards vertical with the launch of it’s vertical video ads in 2015, and has reported that they have “up to 9x more completed views than their horizontal counterparts.” and “5x greater consumer engagement (swipe-ups) when compared to click-through rates on most mobile ads”. This month Instagram just launched it’s IGTV, in hopes of rivalling YouTube with a platform for watching shot and longform videos but in 9:16 format. For digital advertisers, vertical video offers the advantage of filling an entire screen with your branded content- a similar experience to watching a TV commercial, but with the added bonus of being able to further strategize your delivery by retargeting audiences and lookalikes, specifying audience demographics and timing them specifically to the habits of your audience. Additionally, vertical video ads on SnapChat and Instagram Stories provide the opportunity for a call-to-action to be included at the end- with interactive features for the consumers to swipe up and engage further with the brands offerings. With the introduction of IGTV and platforms like Netflix and many of the worlds biggest brands getting on board with the transition to vertical, it is clear that this trend is one you will want to adopt sooner rather than later for your business no matter what the size. It is important to note that optimizing creative assets to work with this new format is not quite as basic as a simple ratio conversion. It is possible to repurpose your current content to work on a vertical screen. However, for ad and social creative that has not been produced with the vertical orientation in mind, there are some challenges that must be overcome in order to showcase the action that a horizontal edit may have captured before. Techniques for optimizing vertical video's performance range from using split screens and additional cuts to show the full span of action that may be captured on a horizontal screen. Both have been seen to result in higher conversions and a better viewing experince. Now is the time to Say Yes to Vertical Video and start putting together some Vertical Video Best Practices for your business. If you are overwhelmed at the though of converting your horizontal content, don't despair! ChopShop editors are experienced in creative conversions to the 9:16 format and are here to help. Send an e-mail hello@chopshop.co to get a quote for your next conversion project.